Not long after the creation of the New Realist group, Jean Tinguely produced theBaluba series, using all sorts of everyday objects: plastic toys, furs, scrap iron and more. In their general aesthetic, these are comparable to Daniel Spoerri’s snare-pictures or Arman’s trash-cans. 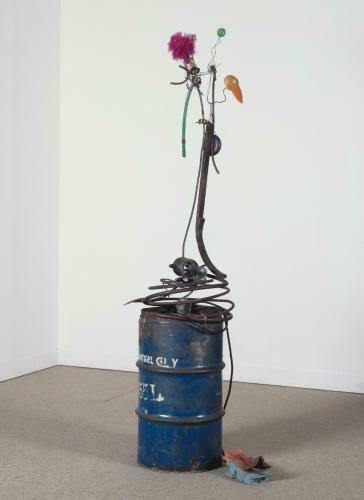 Tinguely was in some way parodying classical sculpture, for he used metal drums as plinths, and was careful in the arrangement of elements, here crowned with a feather duster, as if in place of a hat. But when viewers press on the foot-pedal and set the sculpture into motion they witness a joyful sight as all the suspended parts begin to move this way and that. That which when immobile seems incomplete and unsatisfying becomes, in movement, absurdly enchanting, like many of Tinguely’s later works.